In I Find Your Lack of Faith Disturbing, A. D. Jameson takes geeks and non-geeks alike on a surprising and insightful journey through the science fiction, fantasy, and superhero franchises that now dominate pop culture. 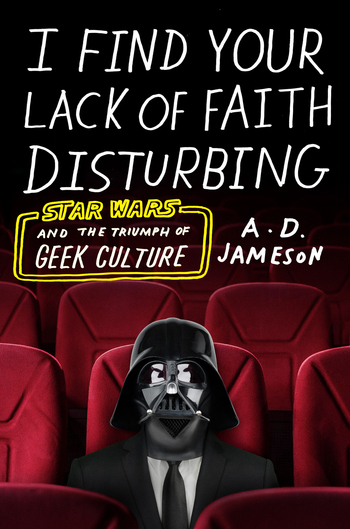 Walking us through the rise of geekdom from its underground origins to the top of the box office and bestseller lists, Jameson takes in franchises like The Lord of the Rings, Guardians of the Galaxy, Harry Potter, Star Trek, and, in particular, Star Wars—as well as phenomena like fan fiction, cosplay, and YouTube parodies. Along the way, he blasts through the clichés surrounding geek culture: that its fans are mindless consumers who will embrace all things Spider-Man or Batman, regardless of quality; or that the popularity and financial success of Star Wars led to the death of ambitious filmmaking. A lifelong geek, Jameson shines a new light on beloved classics, explaining the enormous love (and hate) they are capable of inspiring in fan and non-fan alike, while exploding misconceptions as to how and why they were made. I Find Your Lack of Faith Disturbing tells the story of how the geeks have inherited the earth. A. D. Jameson is the author of several books, including Cinemaps, a collaboration with the artist Andrew DeGraff. A former blogger for HTML Giant, his fiction has appeared in Conjunctions, Denver Quarterly, Unstuck, and elsewhere. He is a PhD candidate in the Program for Writers at the University of Illinois in Chicago.